Ford designed their all-new 6R140 TorqShift Six-Speed Transmission to meet the power from both the 6.7 liter Power Stroke and the 6.2 liter gasoline V8, a unique proposition considering diesels provide their power at low speeds and gasoline motors have much higher red lines than diesels. The new six-speed does this by combining tried and true systems with modern manufacturing capabilities. According to Ford, the trick to the transmission is augmenting a traditional Lapelletier powerflow with a sintered, powder metal carrier for the planetary gearset. It allows high strength in a complex part able to stand up to both the high speed and high torque requirements of both engines. The common transmission allows Ford to focus as much on the shifting and control strategy as it does the mechanics, and as a result this trans packs some nifty tricks. The six gears are spread out to provide low end grunt and high end efficiency, but with a degree of control truck transmissions rarely get. The trans can be operated in traditional automatic or a fully manual mode, where gear selection locks the torque converter and hold the gear as long as the driver sees fit. It'll bog all the way down to 900 RPM before shifting out. The 6R140 also takes a page from the F150 and uses a tow haul mode which improves control and braking in hilly situations. Perhaps the neatest trick comes with the diesel application. A honest to God power take off will be available for heavy duty applications like driving salt spreaders, sweepers, and any manner of mechanical what-have-you. See, new transmission can still get old tricks. DALLAS, Sept. 24, 2009 – All-new diesel and gasoline engines are key reasons why the 2011 Ford F-Series Super Duty maintains best-in-class towing and payload and adds enhanced off-road capability. Managing the increased horsepower and torque is the all-new 6R140 heavy-duty TorqShift® six-speed transmission, which delivers power quickly and seamlessly while maximizing fuel economy. "Our new transmission perfectly complements our new diesel and gasoline engines to give the customer the best powertrain for Super Duty applications," said Al Bruck, 6R140 transmission engineering manager. "Rigorous testing ensures our transmission and powertrain is up to the challenge of even our most demanding Super Duty customers. Overall, the 6R140 heavy-duty TorqShift six-speed transmission enables greater customer capability, efficiency and control than ever before." 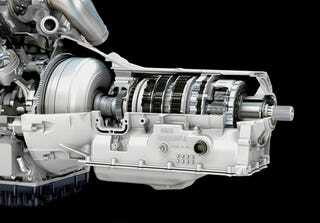 Creating a transmission to serve both diesel and gasoline engines in a Super Duty application is a challenging proposition because the gearbox needs to deliver the substantial low-rpm torque produced by the diesel engine and efficiently use the higher rotational speeds of the gasoline engine. The solution was to use a proven architecture, but adapt it for heavy-duty use. Ford's 6R140 TorqShift transmission uses a Lepelletier-style powerflow, which is a proven technology in rear-wheel-drive vehicles but not typically used with larger diesel engines. A key benefit of the Lepelletier architecture is that it reduces the complexity in connecting the gearsets and clutches. The six speeds require only five clutches, and the speeds of the clutches relative to one another are low, increasing the efficiency of the system. To handle the torque of the 6.7-liter Power Stroke V-8 turbocharged diesel, Ford strengthened the system by employing a unique powder-metal carrier in the compound Ravigneaux planetary gearset. The carrier consists of four pressed powder-metal components sinter-brazed together to form a rigid, power-dense structure. This solution ensures robustness and makes the architecture compatible with both the diesel and gasoline engines. A Ford-patented rocker one-way clutch is integrated with the carrier and helps improve 1-2 shift quality through the gearset. "With this architecture, the new transmission can handle the enormous low-end torque produced by the new diesel engine as well as the high speeds produced by the new gas engine," Bruck said. "The sinter-brazed gearset enables more torque capacity and greater engine speed capability." A deep first gear ratio and two overdrive gears create a wider ratio span. This, combined with available lower axle gear ratios and a control system that automatically selects the most efficient shift schedule, provides an outstanding combination of pulling power and fuel economy. "Our first gear ratio is a fair amount deeper than our competitors, so customers will get improved off-the-line performance," Bruck said. "The six ratios we've selected provide greater overall span and better overdrive performance, which reduces engine speed in highway conditions and improves fuel economy." "Because we have six gears, we make smaller steps gear to gear, which helps keep the engine in its sweet spot in terms of performance and efficiency." The 6R140's heavy-duty TorqShift six-speed transmission balances convenience and control by automatically shifting during routine operation and also allowing complete manual control. It features SelectShift Automatic transmission functionality, which includes both Progressive Range Select and manual functions. With Progressive Range Select, a toggle on the shift lever allows the customer to reduce the range of available gears while in Drive. When the customer "taps" down into Range Select mode, the display shows the available gears and highlights the current gear state. This feature allows the driver to limit use of upper gears when heavily loaded or while towing on grades. For full manual function, customers also can pull the shift lever into "M" for manual mode and use the same toggle switch to select the gear desired. The display will show the selected gear, and the control system will lock the torque converter and hold that gear for a full manual transmission feel. The 6R140 transmission also features standard enhanced Tow Haul capability, which provides better control when hauling a heavy load or towing a trailer, especially when going down grades. The improved system uses an array of sophisticated electronic sensors to better predict the driver's need for a downshift to provide engine braking and enhanced control. The torque converter of the 6R140 transmission is designed to be accurately controlled and efficient. A closed-piston design provides precise control of the lock-up clutch. Its torque multiplication is matched with the rest of the powertrain for better off-the-line performance, but that's only the start. Once under way, a long-travel, high-capacity turbine damper allows the torque converter to dampen out the extreme torsional force produced in particular by the new, more powerful diesel engine. "This damper allows us to lug down to 900 rpm while our competitors lug to around 1,100 rpm," Bruck said. "This technology allows us to stay locked more, which means the engine can run at a lower rpm and get better fuel economy." Another example of taking a proven technology and applying it to the Super Duty to improve customer productivity is the availability of segment-exclusive Live Drive PTO (Power Take Off). On 2011 Ford Super Duty diesels with the PTO prep option, the PTO output gear is linked through the torque converter to the engine crankshaft. This allows the transmission to power auxiliary equipment such as snowplows, aerial lifts, cement mixers, tow truck lifts or dump trucks. The power is available any time the engine is running. Pioneered on agricultural applications, the Live Drive feature is particularly useful when mobile PTO function is required during start-stop operations, such as salt spreading or snow plowing. "A fully functional Live Drive mobile PTO will allow Super Duty customers to take full advantage of the equipment on their trucks," said Bruck. The 6R140 transmission has undergone extensive durability and reliability testing in Ford's supercomputers, in the lab and on the road to ensure customer satisfaction. Extensive computer-aided engineering was completed before the hardware phase began for improved efficiency in terms of time and reduced failures. Once the analysis was complete, physical testing in the laboratory included running the new transmission 24/7 while mated to both engines to help ensure real-world durability. The transmission was rigorously tested – at unloaded and maximum GCW (Gross Combined Weight) duty cycles – for 250,000 equivalent miles to replicate what the most demanding, harshest Super Duty customer can dish out. The 6R140 heavy-duty transmission will be built at the Sharonville (Ohio) Transmission Plant.